Discover the Colosseum, Roman Forum, and the tucked-away treasures of the Church of St. Peter in Chains (San Pietro in Vincoli). On this half-day private tour, you’ll hear the stories of Ancient Rome and the Renaissance that bring the monuments and artwork to life. Visit the Colosseum with a skip-the-line ticket, explore Palatine Hill and the Roman Forum, then check out Michelangelo’s ‘Moses’ inside the Church of St. Peter in Chains. Choose from a morning or afternoon tour when you book. The inclusion of a 5th-century church sets apart this Colosseum and Forum private walking tour from others. Meet your private guide at 8:45am or 2:30pm near the Arch of Constantine in the heart of Ancient Rome. Together, you’ll stroll to the Colosseum and step straight inside with your fast-access, skip-the-line ticket. Explore the gladiatorial arena, hearing tales of what life was like in the Rome Empire and the senators and emperors that presided over the Colosseum’s bloodiest games. From the ancient amphitheater, you’ll take a walk up Palatine Hill to see where the emperors’ houses were built and learn more about Imperial Rome. Swing by the Roman Forum to see the ruined temples and monuments that hark back to the city’s ancient glory days. Hear stories about everyday life in the marketplaces and piazzas of the old forum, then stroll onward to your final stop: the Church of St. Peter in Chains. Named after the chains that held St. Peter captive in both Rome and Jerusalem, the church is rich in religious history and Renaissance art. 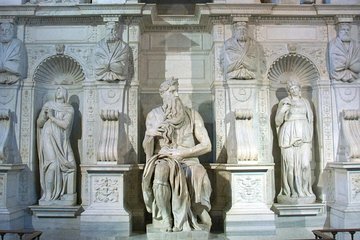 Michelangelo’s acclaimed sculpture of Moses is a highlight. Your tour ends inside the church.